Purchase of Archives | "How the Russell Papers Came"
McMaster University is home to the scholarly study of Bertrand Russell (1872–1970), British philosopher, logician, essayist, and renowned peace advocate. 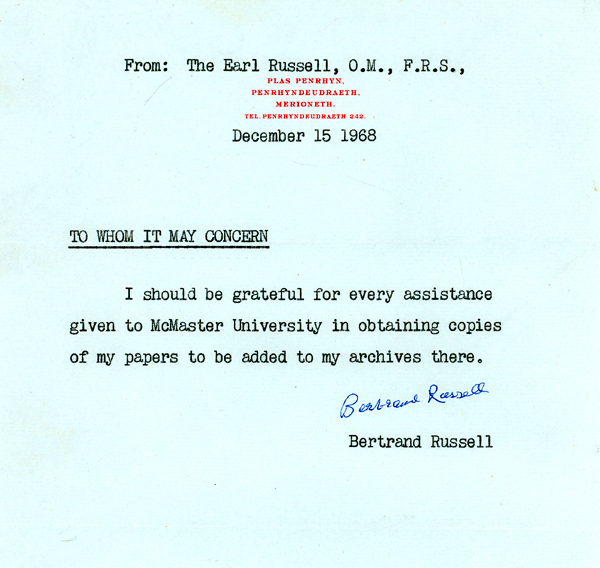 The Bertrand Russell Archives came to McMaster Library in 1968, where they are in the Ready Division of Archives and Research Collections. Russell's library is part of the Russell Archives, along with his correspondence, manuscripts, tapes, films, photographs, medals and permanently displayed writing desk. Read the fonds level description. Send us any queries you may have about the Russell Archives. The Russell Research Centre is editing Russell's Collected Papers and Collected Letters. For synopses of Russell's life and philosophy, see the entry by Andrew Irvine in the Stanford Encyclopedia of Philosophy and (for those signed on to campus access or with hard copy) the entry by Nicholas Griffin in the Routledge Encyclopedia of Philosophy. For dozens of scanned images of documents and other artifacts relating to Russell's life, and for accompanying text that introduces readers newly interested in Russell studies to the Bertrand Russell Archives, visit the Bertrand Russell Gallery. A collection of cartoons featuring Russell is at the University of Kent. 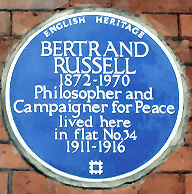 The commemorative blue plaque for Russell below is affixed to the building at 34 Russell Chambers, Bury St., London. For book catalogues of the original holdings, see B. Feinberg, ed., A Detailed Catalogue of the Archives of Bertrand Russell (London: Continuum, 1967; a large file). In 1973 another large purchase arrived from Lord Russell's estate. See K. Blackwell and C. Spadoni, A Detailed Catalogue of the Second Archives of Bertrand Russell (Bristol: Thoemmes, 1992). Acquisitions have been made from the Bertrand Russell Peace Foundation and many other sources. The Bertrand Russell Archives Catalogue Entry and Research System, BRACERS, is an online database of over 132,000 correspondence records, including much rich annotation and quotations from Bertrand Russell's letters. It is undergoing a major revision as it is being migrated from the campus mainframe to a Library Systems server. The new BRACERS went live on November 18, 2014. Advanced inquiries have been written, including date searches. The full text of some letters is available online. Apply to the Ready Division staff for assistance. BRACERS Correspondents is a current, dynamic index of over 42,700 persons and groups who corresponded with Russell, with the total number of letters to and from each one. Background to BRACERS is here. The aim is to stay current for new works in all languages. To qualify as forthcoming, a book should be with the publisher or at least contracted for. Email us with additions to the list. "I think it's very desirable that the general educated public should have more understanding of science than it has at present. But I don't want to see the arts squeezed out. Not at all." 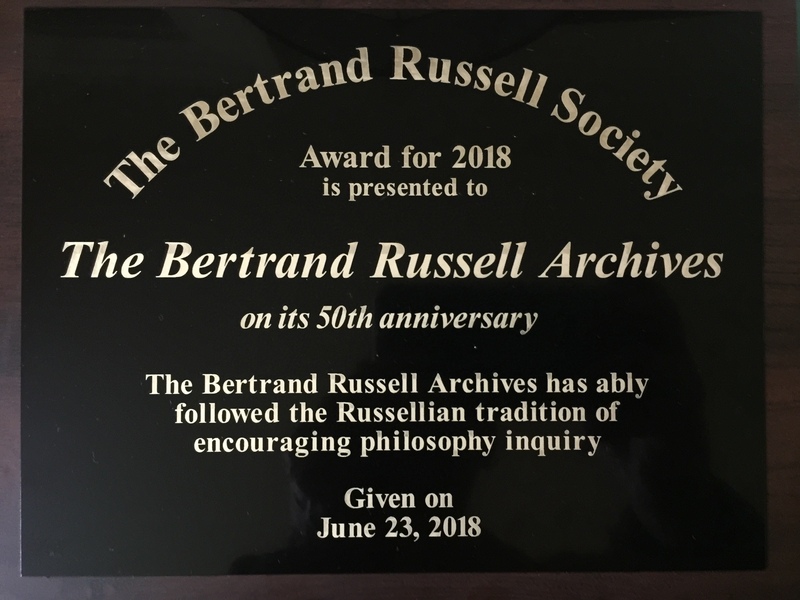 Acquisition of "Russell Archives 4"
Newly digitized: The Brixton Letters and "Dear Bertie"
(Above) The Bertrand Russell Society Award for 2018 was made, not as is normal to an individual or organization, but to Bertrand Russell's nachlass itself, his legacy for inspiring philosophical and political enquiry and leadership and for writing clearly, which means honestly. (Above) This is the new archival reading room in Russell House, opened in June 2018, 50 years after the Bertrand Russell Archives came to McMaster. (Above) The photo is of a display of caricatures of Russell during the 2018 exhibit in the McMaster Museum of Art. (Above) The photo is of a newly acquired three-piece suit belonging to Bertrand Russell — very thick and woollen to withstand the Welsh winters! It was also on exhibit in the Art Museum. (Below) Lord Russell's authorization for McMaster to collect his papers, to which he transferred the copyright in his unpublished letters regardless of their location. Click the image for a larger version. Website by Kenneth Blackwell. Last updated, 5 April 2019.